The Lighting Africa Lighting Lives in Liberia project was launched in 2012 in response to the acute lack of energy access across the country. 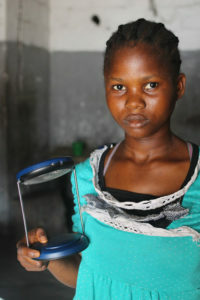 With only 1.2% of the rural population connected to the grid, the need for off-grid lighting and energy products in Liberia is immense. After our market assessment study found that both the off-grid market and consumer awareness of off-grid products in Liberia was basically non-existent, we began to work with the newly-created Rural Renewable Energy Agency (RREA) to jump-start the market. Our activities to date have been focused on creating a business network, as well as on lowering the cost of the products to end-users. Additionally, as women and their families benefit greatly from better lighting and energy access in terms of time-saving and improved health, we are paying particular attention to the gender dynamics related to affordability and technology preferences. To develop the local supply chain, we brought together local retailers, manufacturers of products meeting our Quality Standards, and financial institutions. The retailer partners – which include NGOs, women’s groups, and SMEs – were selected by the RREA following an assessment of their business practices. Some of these retailers focused on utilizing women’s groups in particular for last-mile distribution of off-grid products, thereby creating income-generating opportunities for women. All of these partners receive technical, financial, and business training to help them establish and grow their business. The benefits of this approach have included, amongst others, increased access to finance for consumers by using group saving mechanisms, higher consumer awareness, and heightened product familiarity. Retail partners are also eligible to import quality-verified products through the RREA, which serves as a bulk procurer. Retailers can order products meeting our Standards paying only 10% up front, with the balance due upon collection. Importantly, retailers do not need to collect their entire purchase at once. This greatly reduces their need for capital stocks, as they can collect a portion of their order, sell it, and then use those funds to pick up more of their order. Additionally, all import tariffs are waived for products imported by the RREA, lowering the cost all along the supply-chain and reducing final retail price to consumers. 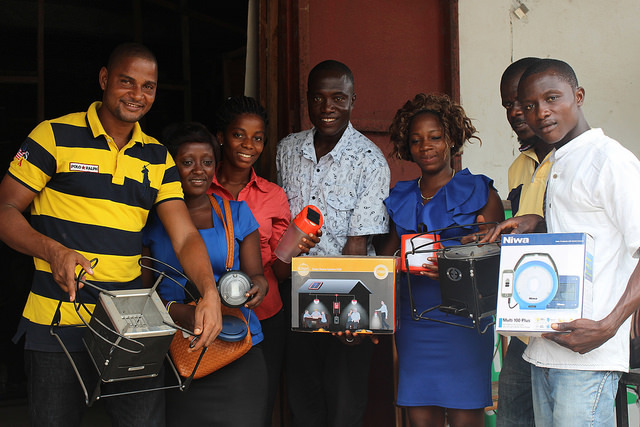 These activities have already supported the sale of 20,000 off-grid products through local retail partners, providing improved lighting for over 50,000 people in Liberia. Unfortunately, the Ebola epidemic temporarily crushed the progress that had been made. Retailers collapsed, roads were closed, payments were defaulted, and sales dropped to practically zero. But today there is reason to be hopeful. “Product sales aren’t yet at the level they were before Ebola, but they are picking up,” Jenny Hasselston, Lighting Africa program manager. Looking forward, Lighting Africa will be engaging with the private sector to step in to fill the procurement role that RREA is currently playing, as well as reaching out to financial institutions, and additional retailers and manufacturers to grow the fledgling market. Liberia will also be part of the Regional Off-Grid Electrification Project (ROGEP). The Regional Off-Grid Electrification Project (ROGEP) will aim to increase electricity access to households, businesses, and communities through modern off-grid electrification in the 15 Economic Community of West African States (ECOWAS) countries (Benin, Burkina Faso, Cape Verde, Côte d’Ivoire, the Gambia, Ghana, Guinea, Guinea-Bissau, Liberia, Mali, Niger, Nigeria, Senegal, Sierra Leone, and Togo) as well as Cameroon, the Central African Republic (CAR), Chad, and Mauritania. Lighting Africa will support ROGEP by working with both the governments and the private sector to make quality-verified off-grid solar lighting and energy products more readily available in West Africa. We will work closely with the ECOWAS Centre for Renewable Energy and Energy Efficiency (ECREEE), ROGEP’s implementing agency, to draw new actors to the market, and support existing players in growing their sales. You can read more about ROGEP here. This page was last updated February 2018. Impact data was last updated December 2018.